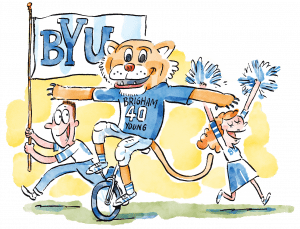 BYU’s beloved mascot has entertained fans for more than six decades. As poor newlyweds at BYU, my wife and I were constantly in search of cheap entertainment. Our search often led us to the Smith Fieldhouse, where the women’s volleyball team thrilled us with athletic feats. Second only to the volleyball was the joy of watching Cosmo gallivant through the crowd, inspiring spectators to cheer on the Cougs. 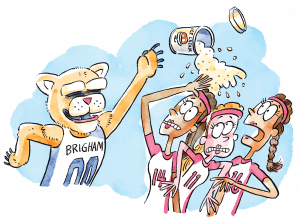 One night during a timeout, Cosmo reached into his bag of tricks and pulled out a pint of BYU Creamery ice cream. He waved it before the crowd, promising it to the most jubilant fan. Finding the winner about 10 rows back, Cosmo cocked his arm and let the ice cream fly. Thousands of spectators watched as the lid slipped off in midair and a pint of melted cookies and cream splattered the entire visiting team. As the athletes reached for towels to remove the sticky mess from their hair and uniforms, an embarrassed Cosmo sprinted from the arena. Cosmo had only recently been created when I entered the Y. In 1955 I was Cougarettes commandant, but I was also asked to show up to dances, ball games, and assemblies as Cosmo. One time a helicopter dropped me off in the middle of our football field at halftime and I bounced away on a pogo stick, much to the delight of the crowd. The secret of my identity was always being challenged. At a football game at the University of Utah, I noticed some Ute student boys who had decided to catch me and let the “cat out of the bag.” My chaperone and I managed to make it to our car, the Utes in hot pursuit. Eventually we lost them, returning home to my den still incognito. In 1959 BYU began to offer a variety of pregame activities, including a pseudo-football game with six men and six women. On the quad near the Eyring Science Center, we practiced our choreographed routine, which included a statue of liberty play, backward passes, carrying players beyond the goal line, and crawling through opponents’ legs to gain yardage. Arrayed in old jerseys, shoulder pads, and helmets, we almost looked fierce. After our performance, the activities vice president asked me to linger. As no Cosmo had been selected yet, he begged me to give it a chance. Not much acrobatic skill was required for Cosmo then, so I tried on the costume, adjusted the head, and ran off to the stadium. I pranced behind the Pom-Pom Girls, mimicking their routines. I ran into the crowd and hugged young fans. At halftime, I marched behind the band. When they suddenly turned and came right at me, I feigned surprise and flattened myself on the turf. They marched over me, never missing a step, a trick that inspired laughter and applause. This was getting heady, but it would turn out to be a one-time performance as Cosmo’s identity was never revealed until the last basketball game, so secrecy was paramount. Evidently, my theatre department background showed in every move I made and most of my friends recognized me. But I have still loved telling my grandchildren that for one brief shining moment, I was Cosmo! My roommate Ron Swapp was Cosmo during the 1969–70 school year. He was a creative guy who added some fun activities to the Cosmo routine at that time. He reintroduced a daring bungee-cord stunt and also rode a unicycle, a real accomplishment as Cosmo’s big head created some balance challenges. Several times each football game, he would ride the unicycle down the running track in front of the crowd. As he passed, the students would stand and cheer, creating a “wave” response. Back then basketball games were played in the Smith Fieldhouse, where a press box was suspended above the student section. Ron found a bungee cord long enough to attach to both ends of the press box, then draped a flat auto innertube over the middle for a seat so he could put his legs through, sit on the tube, and hold on to the cord. We would pull him back as far as we could in the upper row of the student section and let him go. The crowd would cheer as he shot back and forth over the students and the edge of the raised playing floor during timeouts and halftime. The unicycle and bungee cord became permanent fixtures at our apartment complex, and many residents enjoyed using them. During my sophomore year, my roommate and former mission companion was Cosmo. Keeping his identity top secret was one of the responsibilities of sharing an apartment with the most popular cougar on campus. In addition, I drove Cosmo to events, acted as his bodyguard, and even filled in for him when he had to be two places at once. I still have a picture of me performing at a sparsely attended basketball game while the real Cosmo revved up crowds at the Holiday Bowl. As spring term came to an end, I decided to use the Cosmo suit as part of my proposal to my girlfriend. With flowers and a card, I excitedly ran down the stairs of the Tanner Building dressed as Cosmo for the last time that school year. Finding the auditorium where her marketing class was held, I was surprised to see a note on the door announcing that class had been canceled that day! Dejected, I exited the building, tossed the card and flowers into the backseat of my rusty 1969 VW bug, and went back to my apartment to change. Later that day, my girlfriend asked to borrow my car. Completely forgetting about my botched-proposal props, I handed her the keys and headed to class. Later that night, she returned the car and, with a puzzled expression, asked if the card and wilted flowers in the backseat were for her. I admitted my defeat, but never did ask her to marry me. We have been married for 35 years, and she is still awaiting a real proposal. At 11:40 a.m. the piercing screech of the Eyring Science Center’s fire alarm startled Blaine M. Harker (BS ’12, PhD ’17), from his homework. After everyone cleared the building, he realized that his lunch—ramen in a black plastic container—was still inside the common area’s microwave, timer long expired. Five minutes later he and a police officer found the smoldering mess, the obvious cause for the alarm. The third-year physics student had forgotten to add water to his noodles. Minimal funds and school demands can be a recipe for creative cuisine and unusual tales. Share a cooking story, along with a relevant recipe (optional), from your BYU days. Deadline: March 5. BYU Magazine pays $50 for stories published in First Person. Send anecdotes (of up to 300 words) to firstperson@byu.edu. Submissions may be edited for length, grammar, appropriateness, or clarity. There are fans, fanatics, and fan antics. We have all three in these tales from BYU alumni.